← A New Flower for the Garden – Perhaps a Clematis? Correction – it’s Impatiens! Sewing the petunia flower was very fast. In fact, it was the quickest I’ve put together a ribbon flower yet, so the sewing sequence I identified with the last one does make a difference for me. I’ll do a post on the sewing sequence when I get started on the next ribbon flower. The back of the petunia. It’s pressed, but the seams are yet to be graded. Next? 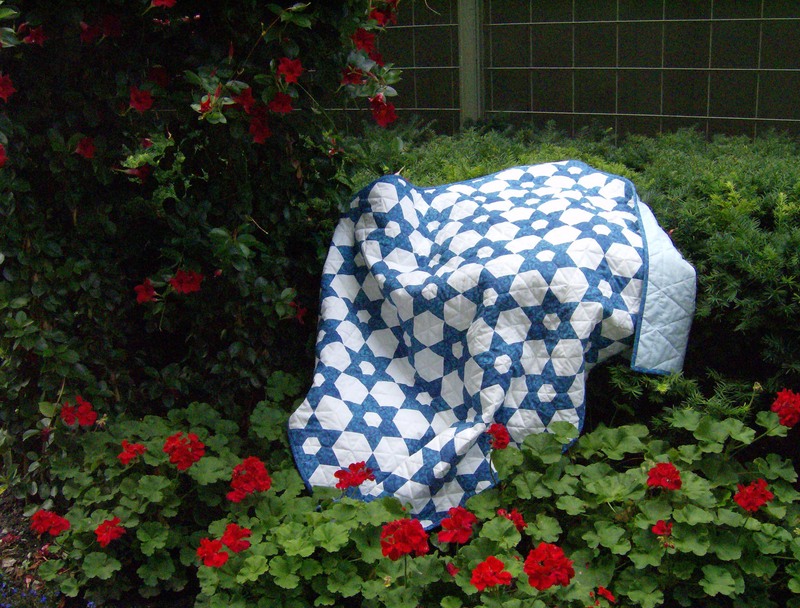 Next I have to decide what other flowers are going to be included in the Gardens Gone Wild quilt. Once that’s done I’ll have to get busy picking out fabrics for each flower and then getting the shapes printed. 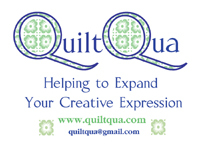 I know there are likely two other flower quilts that will be made, possibly more. When I started looking at zinnias, I was quite drawn to some of the varieties and so think that a small top of zinnias alone may be in the offing along with the tropical hibiscus top. The weekend flowers in the elevator lobby. Jake was watching something out on the roof garden yesterday. Baxter was more intent on getting close to the camera. OOh this may be my favorite. I’ve given up picking favourites – I just can’t as they’re all my favourite at some point. I’m thrilled with how this one turned out, though. That picture of Jake is terrific. He looks so contemplative! 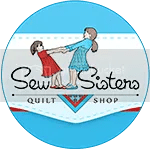 ❤ ttfn 🙂 Yuki Quilting – still cheaper than therapy! Thank you! I love getting good photos of Jake as I think he has a very expressive face. Love that pic of Baxter! Baxter was determined to get too close when I was trying to take that picture – it was a surprise I managed to get one taken of him at all. That on another post? Loving the flowers! I have only recently found your blog. I will write something about the grading of seams. I learned to do that from Linda Franz – it’s taught in her Quilted Diamonds books. There are a few reasons to grade seams. In the case of a block like the ribbon flower where there are 12 seams converging in the middle, grading the seams really helps cut down on the bulk and make it easy to get a block that lies flat after pressing. The values are perfect on this one and it creates transparency as the petals go out. It is such a joy when the right fabrics are in the stash! Thank you! I treasure that comment from you as high praise! I was quite thrilled once I found those fabrics in my stash and then saw them under the daylight lamp. Thank you! Those fabrics really were meant to go together, I think. I love that combining batiks and regular quilting cotton in a block like this can add something a little bit extra when it comes to shading. That is gorgeous! The colours are so rich. The elevator lobby flowers are beautiful! That florist would so appreciate your Garden of Flowers Gone Wild. Maybe some day you’ll meet. I also like Baxter’s close-up. Thanks, Liz. Purple is such a rich, rich colour – perfect for some flowers for my garden. Translucent and beautiful. So sad the onions made the petunia cry!! Tissues right there. Thank you – I am really thrilled with that one. Love those whiskers one on each side of Baxters nose. So cute. This is the best flower. It rocks. Thank you! It seems that this one is the best flower – so far. You are the only person who has noticed Baxter’s little nose whiskers in that photo. They fascinate me and I love trying to get a picture of them. One of my favorites! Love the background. Thank you!! I’ve had that background fabric pulled, just waiting for the right flower ever since I started this project. Cathi—–You nailed transparency. Perfect ribbon flower. Hi Cathi, how beautiful this one is. It reminds me of a suncatcher, the stained glass ones…. like I said… your fantastic with fabric placement. Thank you! Putting these flowers together has made me really appreciate my stash! I love pulling fabrics for a flower once I have an idea in mind. Baxter is determined to put his nose right on the phone and he can be VERY insistent!